One of Valencia's loveliest squares, the Plaza de la Virgen is a great place to sit and soak up the atmosphere among the flapping pigeons. 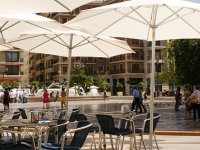 In the centre of this square, which was once the site of the ancient Roman forum, a fountain representing the Turia River gurgles away, surrounded by plenty of open-air cafes. On one side of the square is the impressive Gothic façade of the Palau de la Generalitat, seat of government for the Valencia region, and opposite is the Baroque Basilica de Nuestra Senora de los Desamparados, a grand name for a grand church dating from the 17th century and containing fascinating frescoes. The Plaza de la Virgen is an entertainment hub during the famous Fallas Festival in Valencia. The spring festival (March) sees the community building big, creative sculptures in the square and later burning them. It is a medieval festival in honour of Saint Joseph. Most evenings street entertainers come into the square during the evening and those sitting at cafes are treated to performances by flame-throwers, jugglers and the like. Even when there is no entertainment, the square is ideal for people-watching and photography. It is one of the best known landmarks and gathering places in Valencia.